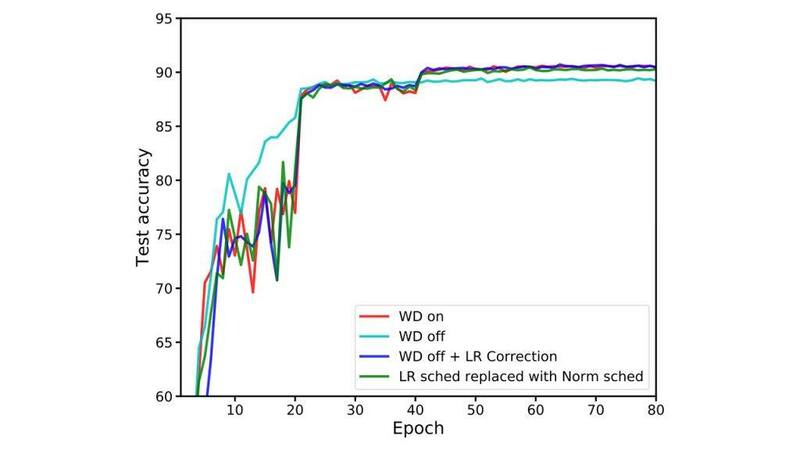 In my last post, I discussed the large presence of AI for social good at the 2018 Conference on Neural Information Processing Systems, better known as NeurIPS. 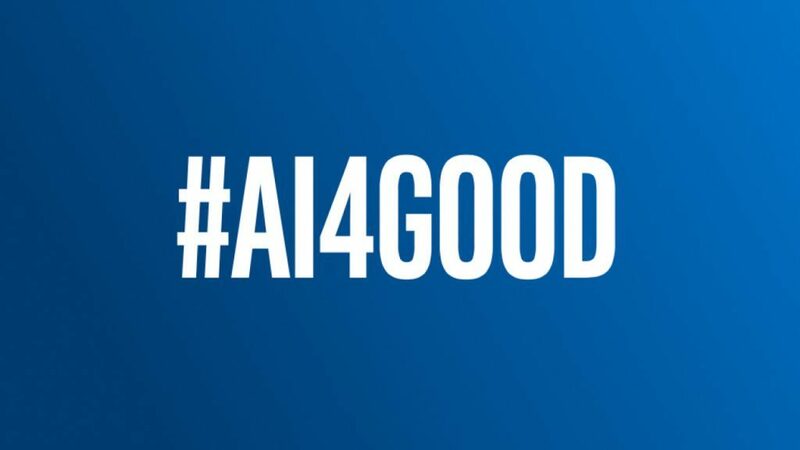 This post continues the coverage of #AI4Good at NeurIPS, with highlights of event discussions around ethics in artificial intelligence (AI). Several keynotes and workshops were devoted to the subjects of ethics, fairness, diversity, and inclusion in AI, including Interpretability and Robustness in Audio, Speech, and Language, the Workshop on Ethical, Social and Governance Issues in AI, Challenges and Opportunities for AI in Financial Services: the Impact of Fairness, Explainability, Accuracy, and Privacy, and the AI for Social Good workshop. 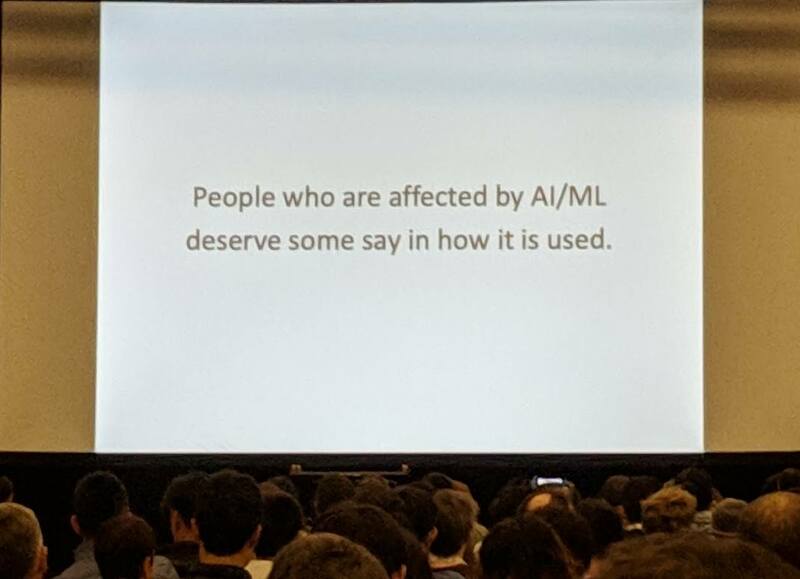 During the event keynotes, one of my favorite slides from Professor Ed Felten stated: “People who are affected by AI/ML deserve some say in how it is used.” He took that sentiment further by encouraging attendees to be involved in the development of public policy for AI. There has been growing discussion (and regulation) of how we should be designing, implementing, and trading machine learning technology both abroad (most notably with the EU’s General Data Protection Regulation), and at home. As the director of Princeton University’s Center for Information Technology Policy as well as serving under former President Obama as the Deputy U.S. Chief Technology Officer, Dr. Felten is an expert in this field. British statistician Sir David Spiegelhalter provided us with real-world examples of building “trustworthy” machine learning algorithms through transparency, explanation, and validation. Concrete examples are beneficial to provide context on how a system can be used, but pointing to previous real-world issues can be difficult from both a legal and ethical perspective as most problems have arisen not out of malice, but from errors in system design. Ethicist Michael Skirpan has taken this idea and created hypothetical, but very realistic, scenarios to elicit ethics discussions. The strategy uses a combination of reality and science fiction to allow participants to truly know the technology in question. 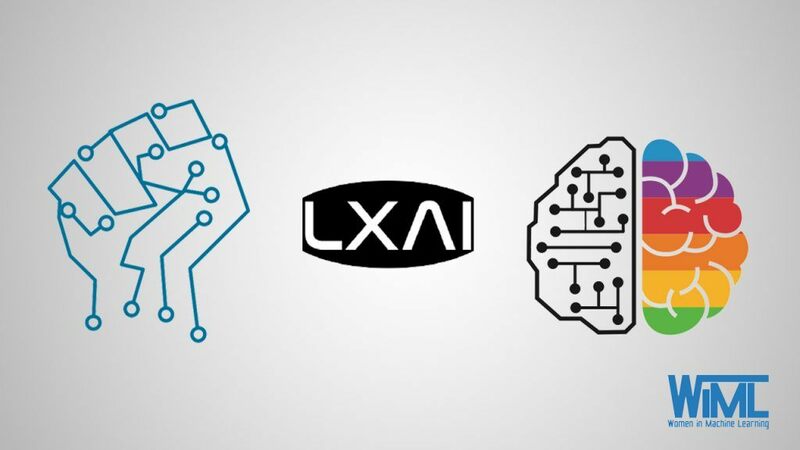 AI Ethics is a broad category that includes topics like fairness, explanation (which is not equivalent to transparency), trust, accountability, and human rights. A common thread that runs through these topics is the attempt to address the question: “How can this system be harmful?” Of course, ethics discussions are not new; they go back centuries to the days of Socrates and Confucius. There is a reason that the Trolley Problem is still discussed in classrooms and (perhaps more recently) board rooms; it is a problem that has no good or optimal answer. However, many engineers want to solve for AI ethics algorithmically which brings us to a key misconception that was raised by an audience member in the ‘Improving Fairness in Machine Learning Systems’ panel during the Workshop on Ethical, Social and Governance Issues in AI. 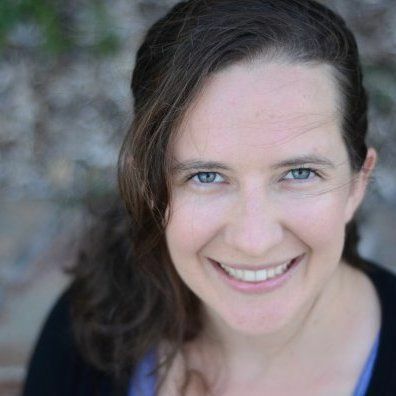 When asked why algorithms are biased, Hanna Wallach of Microsoft Research and UMass Amherst replied that it is not the fault of the algorithm. 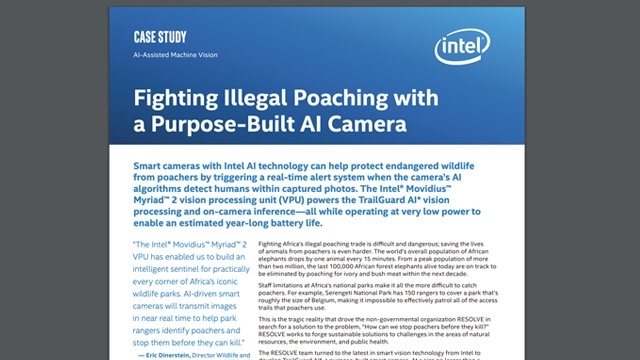 Biases, human rights abuses, and other unethical issues arise from the design of the end system, how the data is collected, labeled, and cleaned, and the manner which the algorithm is tested and deployed. In each of these steps, it is important to consider how the full system will be used and by whom, to ideate and address all potential consequences, and to ensure that there is full and equal representation in the data being collected, the designers of the products, and test cases. Without these steps, the end system can have one or more issues. This isn’t to say that we should stop looking at our algorithms. 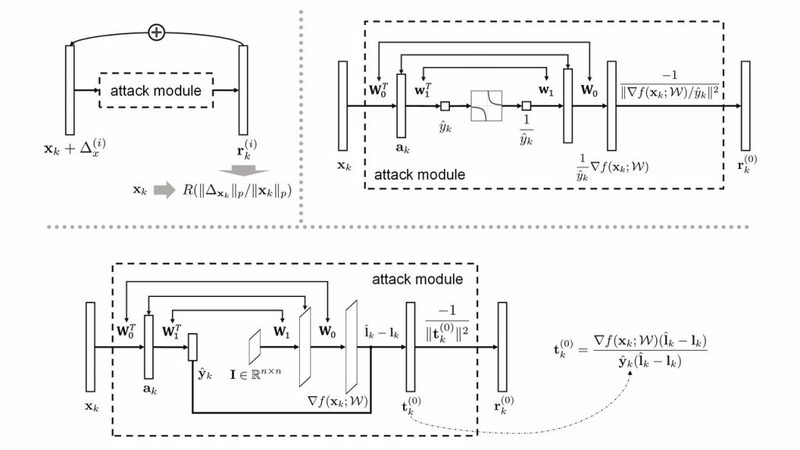 There are some algorithmic modifications that can make a classifier less biased, and advances in techniques like homomorphic encryption, differential privacy and federated learning can help protect data sources. But the algorithm is not to blame when it is found to be biased or unethical. To have these conversations, we need a diverse set of voices involved in all stages of system development. When diversity is discussed in these contexts it goes far beyond what we may look like, but includes aspects of our upbringing, our academic backgrounds, and our professions. We need philosophers, human rights experts, social scientists, and, most importantly, input from the members of the communities that will be most affected by our systems. We all have different perspectives of what is ethical and unethical, how a system could operate and where it could make mistakes, and ultimately if a particular system should be deployed at the end of the day. Having this dissent and conversation is part of the process. It may make deliberations longer, and there may not be a consensus at the end of the day, but it is critical that everyone has a voice. 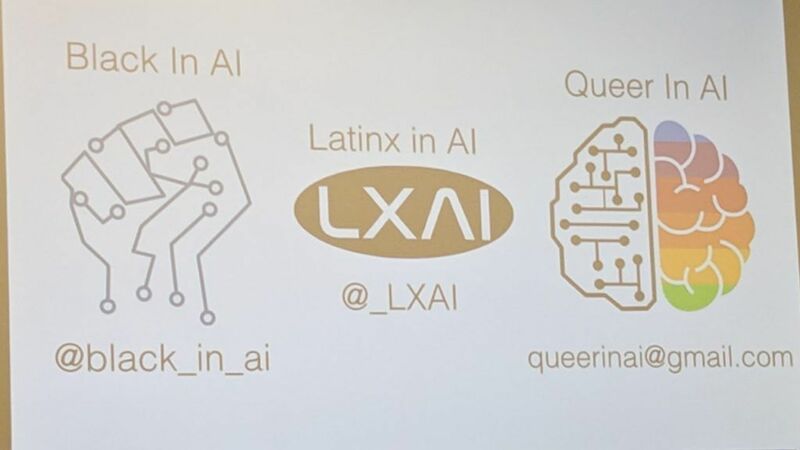 There was more discussion of diversity this year at NeurIPS, and a larger presence of groups including Women in Machine Learning, Queer in AI, Black in AI, and LatinX in AI. Unfortunately, many of the 100 plus researchers denied Visas to the country were part of the Black in AI community. Organizers and champions worked tirelessly to try to get all invited attendees to the conference, and when all else failed, ensured that they could participate remotely. There are political, institutional, and societal hurdles we still need to overcome to ensure everyone has an equal seat at the table, but at least we have started to make that table larger and more inclusive. It is so important to continue conversations and discussions on ethics in AI. The great news is that there has been a large upswing in the number of organizations, companies and individuals that are looking at this issue. In fact, I’m participating in a conversation at the CES conference this week that will explore how to create an ethical framework for AI, and later this month I will be joining a panel on ethics and AI at the Re:Work Deep Learning Summit. In his NeurIPS talk on “Tech and Ethics Reflexes,” Roel Dobbe of the AI Now Institute covered principles, tenets, and guidelines for ethics in AI along with definitions, metrics, and tools from companies, organizations, research institutions, and governments. I will discuss some of these tools in further detail in a future post, but for now I’d like to leave you with a simple checklist from DrivenData called Deon. This checklist provides guidance for all stages of a project to help a developer identify where a system could be unethical and provides resources to reduce these issues.